Ancient Rome was the dominant power for hundreds of years and left a mark on the word. The ancient Roman Coliseum is the single structure that most exemplifies this fact. Perhaps the most well-known of all of the structures in Rome, the ancient Roman Coliseum is an important part of the history of the Roman Empire. This structure, built in the 70's AD, was once the most important site in all of Rome, and also the largest amphitheater built in the Empire. Holding up to 70,000 spectators, ruins of the Coliseum still stand today as a testament to its powerful status in Rome. The ancient Roman Coliseum was originally known as the Flavian Amphitheater, and was built during the reign of emperors Vespasian and his son Titus. 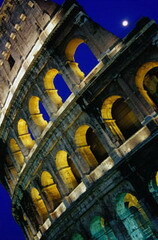 Building on the Coliseum started in the year 72 AD, and was completed in the year 80 AD. The amphitheater was constructed in the location of emperor Nero's lake below the site of his massive palace. The Coliseum was continuously used until the year 217, when a lightning strike caused a fire at the site, causing damage. The amphitheater was repaired by the year 238, and after this gladiators fought here until Christianity ruled the practice was not to be continued. By 508, the Coliseum was in disrepair, in part because of two massive earthquakes that hit the structure. By the Middle Ages, the structure had been hit by even more earthquakes, and was eventually converted into a fortress. A Christian church was even constructed in a small corner of the ancient Roman Coliseum. The original marble outer covering was removed bit by bit, and reused in constructions of other buildings and palaces nearby, and in some cases, burned to produce quicklime. In the Middle Ages is also when the Coliseum gained its name, which is said to have been taken from a colossus, or large statue, of Nero that was located near the structure. The former name of the site, the Flavian Amphitheater, became disused and is hardly known at this time. At the present, the ruins of the ancient Roman Coliseum still stand in Rome. The arena floor no longer exists, but there are still parts of the walls, the underground structures known as the hypogeum, and the 80 separate entrances are still evidenced. Additional buildings were built around the Coliseum to support the site, and there are still parts of these buildings that are standing - such as the armory and gladiator training schools. The Coliseum will continue to be a source of speculation and much study for years to come. We have learned a lot about the history of the structure, but there is still more to learn. Even now, the flora and plant life of the Coliseum holds much mystery, as there have been 684 species of plants discovered there since the 1600's and still more appear. This structure has not yet yielded all of its secrets to the world.